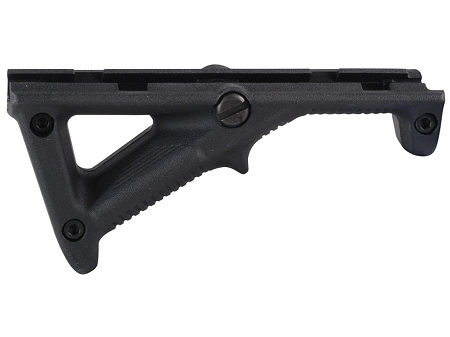 Unlike conventional vertical fore-grips, the Magpul AFG2 (Angled Fore-Grip) takes into account natural body mechanics and provides a comfortable and stable user interface that reduces fatigue and allows for more precise weapon control. By positioning the shooter's hand high on the centerline of the bore, the AFG2 helps mitigate recoil and control the weapon, facilitating faster, more accurate follow-up shots. The AFG2 is a slim line design that is shorter in overall length and width compared to the AFG1. Smaller size allows for compatibility with a wider variety of rail systems, rail covers, and accessory mounts.